Give'em their Life back: Taiz/ Ibb Zoo Lions! One World Actors Productions hasn't added a story. One World Actors Prods.-Animal Rescues French Non-Profit is responding to the call of our followers, who are begging us to release the Taiz Zoo Lions from their horrificly cruel prison-cells NOW by building our Taiz/Ibb architect's new outdoor triple-enclosure design on-site at Taiz Zoo and to repair Ibb Zoo's mountain-side open-range enclosure perimeter fence so we can relocate the rest to this safehouse backwater..
With your vital support, we can get these humane ranges erected on-site, Ibb Zoo's Lion fencing repaired and the Taiz ( and Ibb) Lion Prides freed from their life-long solitary confinement! OWAP-AR N-P. remains true to our moral duty and loyalty to all you Public donor animal lovers around the Planet. We now appeal to you to finance this deeply compassionate, ready-to-go 'Release to Freedom' Project..and give them a Life at last...! At end of January 2016, Kim-Michelle Broderick, President of the French Non-Profit ONE WORLD ACTORS PRODS.- ANIMAL RESCUES, was the first to rally people from around the World to help her stop the mass starvation and deaths of 282 precious, iconic Yemeni Heritage animals, birds and reptiles, currently trapped at closed-down, defunct Taiz Zoo in the midst of a brutal war. Caught up in a bloody blockade for over a year , these enduring CITES Red-Listed beings had been suffering unimaginable cruelty, deprivation and neglect. Working tirelessly on all aspects of our Rescue Mission, from food supplies, enrichments , wooden platforms, enclosure repair, predator rotation Projects, negotiations with Government officials and World Conservation Organisations to drawing up a ready-to-go Evacuation Plan and a list of reputable Wildlife Sanctuaries willing to rehome them for the duration of the War, OWAP-AR's President Kim-Michelle, a British Queen's Guide, Show-Biz Figure and ABWAK Professional Member, is appealing to you to finance this deeply compassionate, ready-to-go 'Release to Freedom' Project..
One World Actors Productions hasn't posted any updates yet. 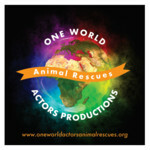 One World Actors Productions is managing the funds for this campaign.